Cuba has never had much tradition in extreme sports, but this has started to change. 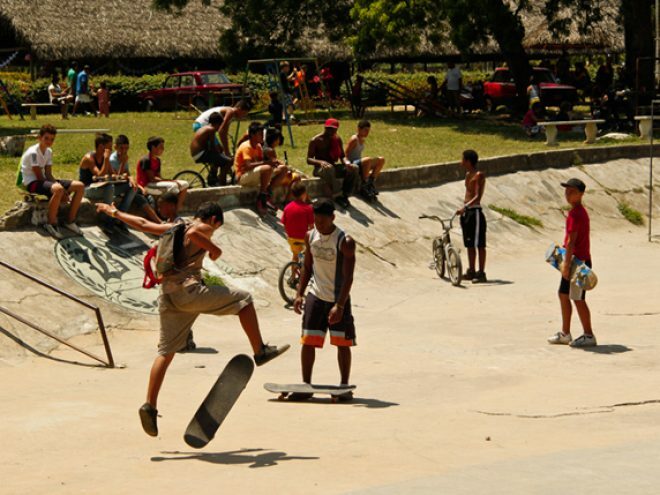 Cuba doesn’t have a very long history in skating, except as recreation for kids. One of the first roller skate competitions took place during the Pan Am Games held in Havana in 1991. Today, skates and skateboards have become a craze among the younger population. Everywhere across the island, you can find skaters with their typical outfits (which to them is as important as the skates themselves): tight Lycra shorts and T-shirts, one—or two—sizes too small. Kids of all ages try their hand at making different tricks, many of which have been learned or copied from the movies. Skill and experience fluctuate: some do not do very well while others are quite good. The skating fever has brought about a problem, which has nothing to do with the sport or hobby. Some teenagers skate in back of buses or cars and eventually climb the rear of these vehicles, endangering their lives. Fortunately, that is not the mainstream of skating. Most kids go to the many parks or plazas that are scattered around the city to show off their skills. It is not uncommon, for instance, to see skaters invading Prado every weekend to practice with a group of friends. Extreme or not, the sport has taken hold and skaters meet to proudly display a new trick, take a few falls or simply hang out.